Namco Bandai’s hunting action game, God Eater 2–or as I like to call it, Monster Hunter with plot–is scheduled for release in Japan this upcoming November. In the meantime, both a PSP and a PS Vita version demo has been made available on the Japanese PlayStation Store, making comparisons possible. "The PSP version was so pretty I was amazed. 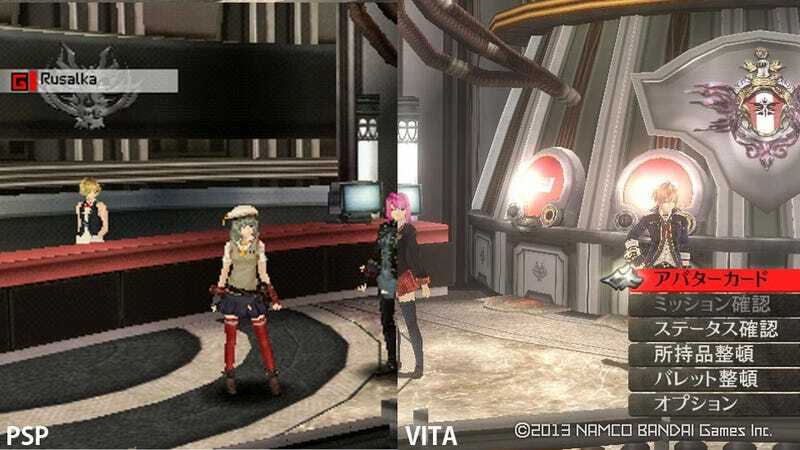 Hardware developers will probably emphasize the VITA and downplay the PSP, but I think the PSP’s graphics are enough to satisfy," remarked one 2ch user. Other people who tried out the PSP version were quick to agree that the graphics quality of the game are overall damn impressive for a nine year-old hand-held console. I tried out the PSP demo for myself and I’m forced to agree that the game looks great on the PSP. Through my hours of Vita games, I’ve grown accustomed to the Vita’s graphic resolution, so it’s hard not to notice some of the PSP’s rough edges at times. Even so, the image quality on the PSP still holds up quite well. That said, the PS Vita is graphically superior to its predecessor. Put up side to side, the differences are pretty obvious. Then again, put a Ferrari side to side with an F1 race car and it's pretty obvious which drives faster–but on their own, each holds up in their individual playing fields. The Vita version may look better, but apparently, put through rigorous play, the game can get stuck once in a while, whereas no such problems have yet been reported on the PSP version. The Vita version also has jiggle physics for the female characters if that’s a deciding factor for you at all. Note: For the following image and the top image, the PSP captures have been blown up to match the PS Vita image size. The actual game image is smaller and thus more smooth. Gameplay-wise, the game handles smoothly and combat can require a bit of skill on the part of the player. I didn’t have TOO much difficulty with the demo, but if the previous game is any indicator, there will be a bit of a learning curve down the line. God Eater 2 is set for release in Japan on November 14th. No word yet on an international release.